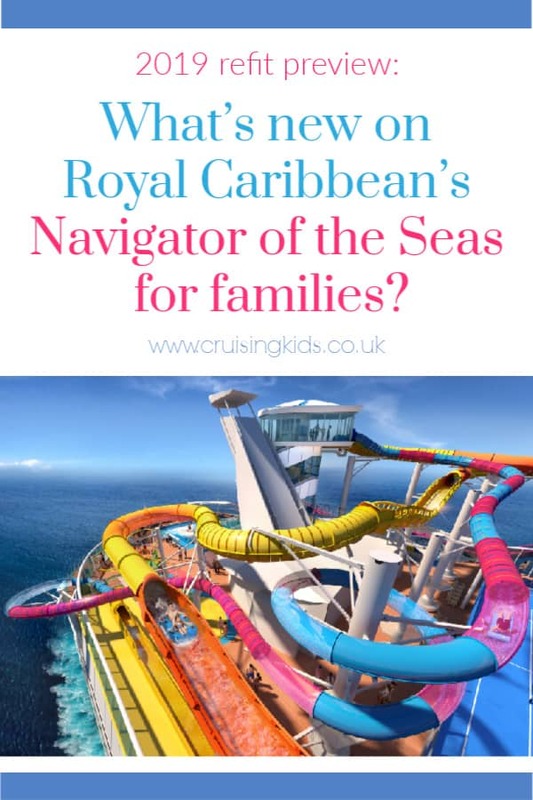 What’s new on Royal Caribbean’s Navigator of the Seas for families? Back in the Spring of 2018 my Cruising With Kids co-editor Lisa and I had the chance to sail on Royal Caribbean’s Navigator of the Seas. While we had a fantastic week with our kids exploring ports like Lisbon, Bilbao and Vigo, I wasn’t completely wowed by the ship – it didn’t have the bells and whistles of newer ships that make RCI such a great cruise line for families. So, when I heard she was up for a refit I was very excited to find out what was new on Navigator of the Seas for families. Here’s an overview of the exciting additions to Navigator when she rejoins the Royal Caribbean fleet in February 2019. Royal Caribbean have ploughed $115 million in to the modernization of Navigator to bring it up to speed and offer some firsts at sea! For me, it was some of the outdoor spaces that were a bit disappointing. Well, the new Caribbean inspired pool scape has addressed that! It looks fantastic and now has family-friendly features like a Splash Pad for tots. Alongside the super cool new pool layout is a new two-level bar The Lime and Coconut and two eateries: El Loco Fresh for Mexican street food and and American classics at the first Johnny Rockets Express. There are also two new waterslides which look incredible. The Blaster, the cruise line’s first-ever aqua coaster and the longest waterslide at sea, is a two person slide. You climb on a raft and are propelled more than 800 feet over hills, down drops and straightaways, including a section over the side of the ship for a rush of ocean air. The other slide, Riptide, is a single rider slide and is the industry’s only headfirst mat racer slide with an exhilarating finish through a translucent tube with endless ocean views. These new fun features are in addition to the FlowRider surf simulator and rock-climbing wall which remain the Sports Deck. Check out this video animation of The Blaster. New restaurants, retail outlets and nightlife venues have been added to Navigator’s Royal Promenade. Having a bad hair day after supervising the kids in the pool? Stop by To Dry For – the first stand alone hair salon at sea for a blow dry, restyle or nail polish. Among the new and revamped bars and restaurants is Jamie’s Italian. My girls adore pasta and pizza, so we’d definitely be stopping by for a taste of celebrity chef Jamie Oliver’s rustic Italian dishes. If water slides aren’t your thing then there’s even more on the reimagined Navigator of the Seas for families below decks. There’s glow-in-the-dark laser tag with Battle for Planet Z in Studio B, mini-golf and the Royal Escape Room: The Observatorium, where family, friends and foes team up to solve new mind-bending puzzles before time runs out. For younger kids Royal Caribbean has souped up the Adventure Ocean youth program. There’s a newly designed open, free play space, which sounds perfect for letting kids run around on sea days. The teen areas also sport updates with a redesigned Living Room – a teen-only laidback hangout, as well as a new “hidden” entrance and outdoor deck that serves up nothing but chill vibes. I want to be a teen again! So where can you expect to find Navigator of the Seas? She’ll be rejoining the fleet on February 24, 2019, for a cruise from Miami. 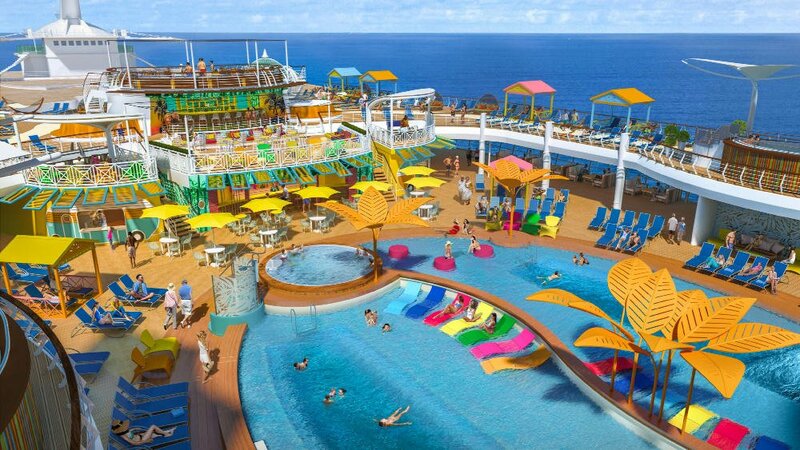 From May 2019, Navigator will offer short Caribbean itineraries and will be the first ship to visit Perfect Day at CocoCay – Royal Caribbean’s new private island. It will feature Thrill Waterpark with 13 jaw-dropping slides, like Daredevil’s Peak – the tallest waterslide in North America; Oasis Lagoon, the Caribbean’s largest freshwater pool; Up, Up and Away, the helium balloon that floats up to 450 feet in the air for the highest vantage point in The Bahamas; Chill Island for some R&R on the beach; and the action-packed South Beach with sports, paddle-boarding, glass-bottom kayaking and more. Wow! All is forgiven Navigator of the Seas. 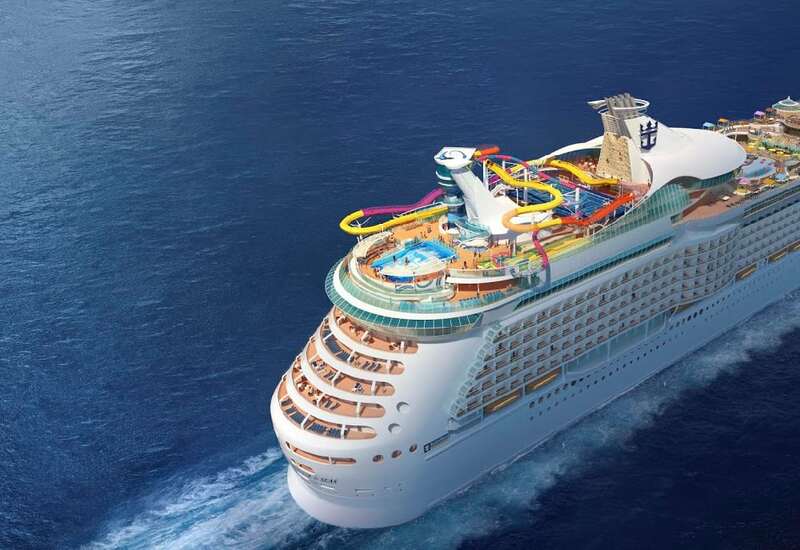 Royal Caribbean’s older ships can rock it like the new kids on the block! If you’d like to read my pre-refit thoughts then take a look at my analysis of Navigator of the Seas – maybe they were listening? Planning a cruise? Why not pin this post about what’s on Navigator of the Seas for families? Next Post Have you been to Wonderland on Symphony of the Seas?